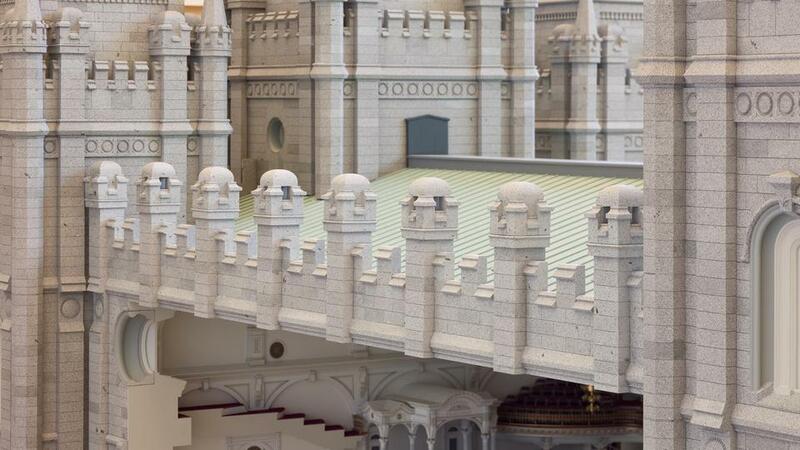 See the Salt Lake Temple in Detailed Model - Very Detailed !! 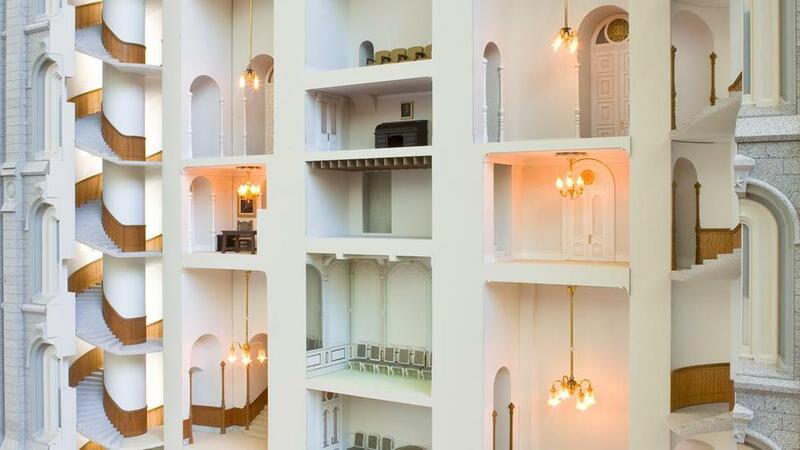 NAUVOO NEWS - More than a century has passed since the public open house was held for the Salt Lake Temple, but an exhibit featuring a 1:32 scaled replica of the Mormon temple opened today that offers an open house experience of the magnificent building. Earlier this morning, The Church of Jesus Christ of Latter-day Saints unveiled the 88-inch tall, near-identical replica of the temple in the South Visitors’ Center on Temple Square. The permanent exhibit will be open to the public starting at 1:30 p.m. today. The Salt Lake Temple was the sixth temple built by the Church. Today there are 132 operating templesthroughout the world. The model was built by Peter McCann Architectural Models of Toronto, Canada. The model is 88 inches tall from temple base to the top of the spires. With the pedestal, the entire display is nearly 12 feet tall. The model weighs somewhere between 600 and 800 pounds. Each glass panel installed in the pedestal weighs 200 to 300 pounds. A 16-member team constructed the model in five months, after several months of preparation. Experts were brought in with specialized skills in model construction, including an electrical engineer and craftsmen who constructed the chandeliers, the structure, parts and interior paintings. Materials used in the model include acrylic plastic, heavy card stock, brass, wood, gold leaf and glass. The model was built in eight different sections. Each section is independent of each other. As part of the Salt Lake Temple renovation announcement on April 19, 2019, President Russell M. Nelson of The Church of Jesus Christ of Latter-day Saints said the Church will make every reasonable effort to honor and maintain the temple’s historic beauty. When will the Salt Lake Temple close? The Salt Lake Temple will close on December 29, 2019. How long will the Salt Lake Temple be closed? The Salt Lake Temple will be closed for about four years. It is expected to reopen in 2024. How will the renovation affect the plaza and other buildings on Temple Square? 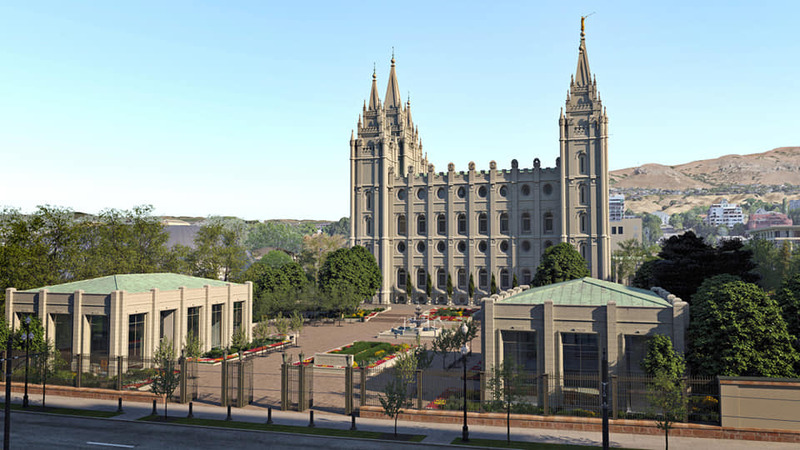 The project will include the removal of the existing temple entry/annex, removal of the South Visitors’ Center, renovation of the historic Salt Lake Temple, construction of new temple entry buildings and visitors’ pavilions, and new hardscape and landscaping. The plaza between State Street on the east and the Main Street Plaza will be repaired and refreshed with greater emphasis on the visitor experience and on the Savior. West of the Main Street Plaza, the temple renovation and nearby site improvements will extend from North Temple to South Temple and from the Tabernacle to the Main Street Plaza. There will still be access to the North Visitors’ Center, the Assembly Hall, the Salt Lake Tabernacle, and other buildings surrounding the Salt Lake Temple. How much of Temple Square will be closed during the renovation, and what can I still visit? Guests can still visit the Family History Library, Church History Museum, Church History Library, Conference Center, Salt Lake Tabernacle, North Visitors’ Center, Assembly Hall, Joseph Smith Memorial Building, Church Office Building, Relief Society Building, Administration Building, Beehive House, and Lion House. 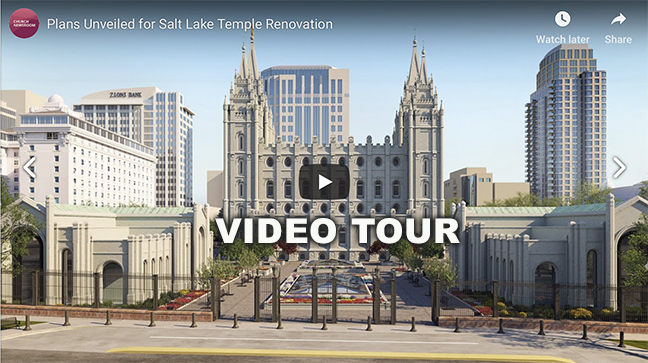 Only the Salt Lake Temple, the South Visitors’ Center, and east plaza area will receive renovation attention. During the renovation, the Church will closely coordinate pedestrian and vehicle traffic issues with Salt Lake City. Tours by missionaries from the Temple Square Mission will continue to be available during construction. How will the Temple Square renovation affect the annual tradition of Christmas lights? Visitors will still be able to come and see Christmas lights, although it may be somewhat limited and smaller during the construction period. How will this affect the Salt Lake Temple District? Patrons who normally attend the Salt Lake Temple are encouraged to attend other nearby temples, including the Ogden, Bountiful, Jordan River, Draper, and Oquirrh Mountain Utah temples, although they may experience increased waiting. There are no plans to formally reassign any Latter-day Saint stakes to other temple districts during the closure. What will be different about the sacred work of the Salt Lake Temple when the renovation is complete? Following the renovation, the Salt Lake Temple will include live and film sessions. The Salt Lake Temple currently has no ability to accommodate patrons who do not speak English. When the renovation is completed, the temple will be able to serve members who speak more than 86 different languages. Where will the weekly meeting of the First Presidency and the Quorum of the Twelve Apostles take place? Administrative meetings held by Church leaders in the temple will be held in designated areas of the Joseph Smith Memorial Building. Will there be an open house and rededication of the Salt Lake Temple when the renovation is finished? Yes. When complete in 2024, the Church will host a public open house, and the Salt Lake Temple will be rededicated. When was the last time the Salt Lake Temple underwent a major renovation? The last major renovation of the Salt Lake Temple was in 1962. The temple closed on July 29 of that year for extensive renovation that included demolition of the old annex; cleaning of the exterior stone; replacement or upgrade of all mechanical systems, plumbing, wiring, carpeting, and light fixtures; reupholstering of furniture; and redecoration of the entire building. The temple reopened on May 21, 1963, according to ChurchofJesusChristTemples.org. On March 7, 1963, the building that would later become the North Visitors’ Center was dedicated as a temporary annex. A new annex built to house seven new sealing rooms, a children’s waiting room, mechanical systems, two new locker rooms, new initiatory areas, and a new chapel seating 450 patrons opened on March 19, 1966. This new annex was dedicated on October 23, 1967. What will change/remain the same about the Salt Lake Temple’s exterior/interior? 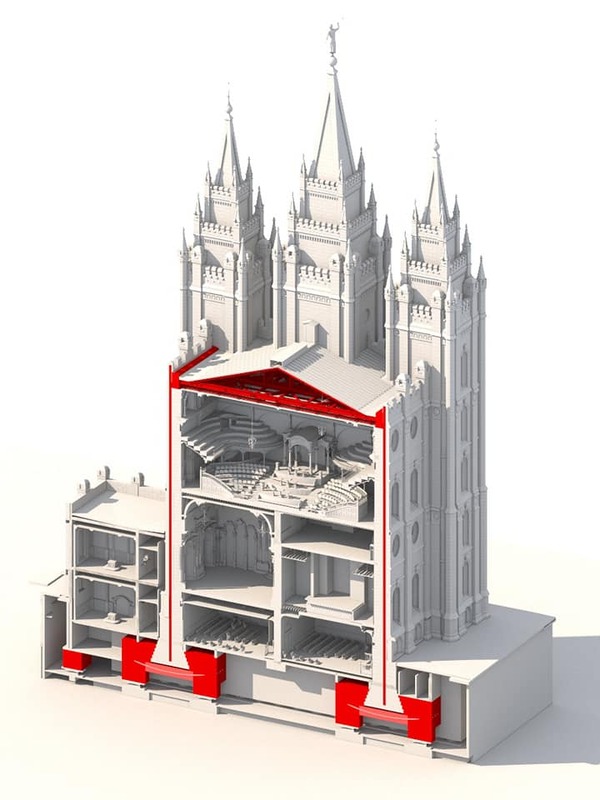 The Church plans to preserve the historic aspects of the Salt Lake Temple’s exterior wall and hopes visitors will feel more welcomed to Temple Square. 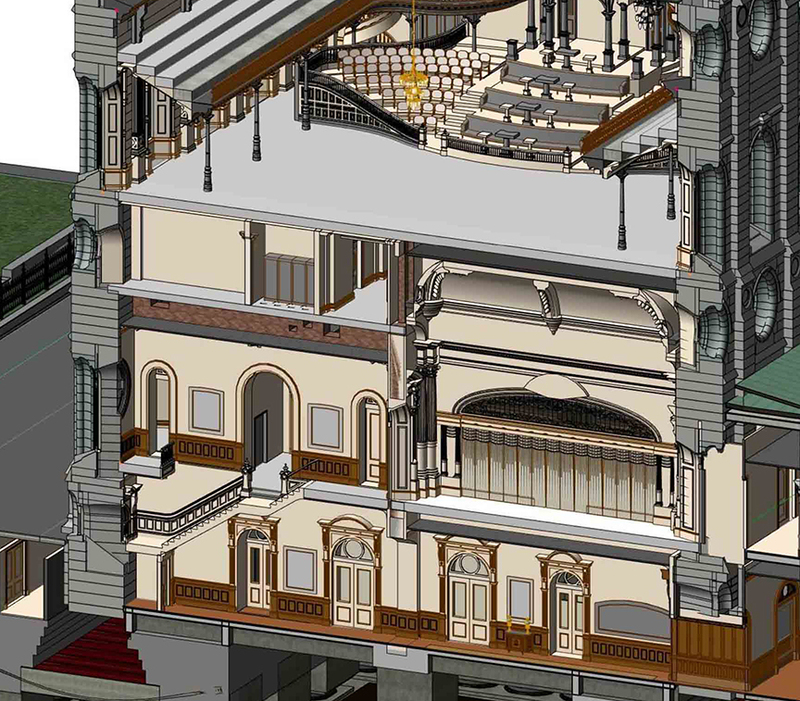 The work of the project is a mix of preservation, restoration, renovation, and new construction. All of the temple’s aging mechanical, electrical, and plumbing systems will be replaced. Extensive research has been undertaken regarding such things as soil composition, granite strength, concrete and plaster sampling, and vibration movement modeling, along with additional research in cooperation with the Church History Department on the historic aspects of the temple, including its original design and subsequent modifications. A detailed study of this research includes paint samples, murals, millwork, and furniture. The renovation will include a significant seismic upgrade to help the temple withstand a large magnitude earthquake. A base isolation system will be installed. The stone spires and walls will need to be strengthened. As part of the project, a new access tunnel will be installed under North Temple Street. The tunnel will grant direct entry to the temple from the Conference Center parking area. The renovation of the plaza east of the temple will make it more public and friendly, with seating areas and new corridors. There will be times during the construction when scaffolding will cover the temple and nightly lighting will be reduced. How will the renovation affect Temple Square activities, such as tours, weddings, parties, concerts, restaurants, and state tourism? Tours by missionaries from the Temple Square Mission will continue to be available during construction, as will access to all the buildings surrounding the temple and plaza. Couples can still make marriage reservations until the temple is closed on December 29. The Church acknowledged the cost of the renovation will be significant but did not disclose a specific figure. Who is doing the architecture and construction? FFKR Architects and Jacobsen Construction. No. The Church will coordinate closely with Salt Lake City to address any pedestrian and vehicle traffic concerns. How much noise and dust will the renovation generate? The project will involve scaffolding on the temple, multiple tower cranes, dust, and noise. The Church hopes to keep the dust to a minimum and comply with Salt Lake City noise ordinances. How will the Church prevent what recently happened with Notre Dame from happening to the Salt Lake Temple? The Church acknowledged the recent Notre Dame fire and understands how construction puts any project at greater risk for a fire. The Church plans to work closely with the contractor, Church risk management, and local fire officials to finalize a fire prevention plan. Will the Tabernacle Choir still rehearse at the Salt Lake Tabernacle during the renovation? The Tabernacle Choir at Temple Square will continue to use the Salt Lake Tabernacle but at times might move over to the Conference Center in coordination with the construction schedule. The Church emphasized that visitors will still be welcome to enjoy the Tabernacle. The surrounding area on Temple Square and the plaza near the Church Office Building will also be affected as existing buildings are demolished and the area undergoes renovation and restoration. The existing annex and temple addition on the north side, which were built in the 1960s to add needed support facilities and more sealing (marriage) rooms, will be demolished and rebuilt. The renovation of the temple will involve replacing the historic building’s aging mechanical, electrical, and plumbing systems, as well as a significant seismic upgrade to help the building withstand a large-magnitude earthquake. The installation of the base isolation system will require deep excavations around the historic footings and foundation of the temple and will also require the strengthening of the stone spires and walls. This project will also include the renovation of part of Temple Square. Portions of the wall around Temple Square will be opened and modified to allow more inviting views and better access to temple grounds. The existing South Visitors’ Center will be demolished and replaced with two new guest and visitor pavilions. 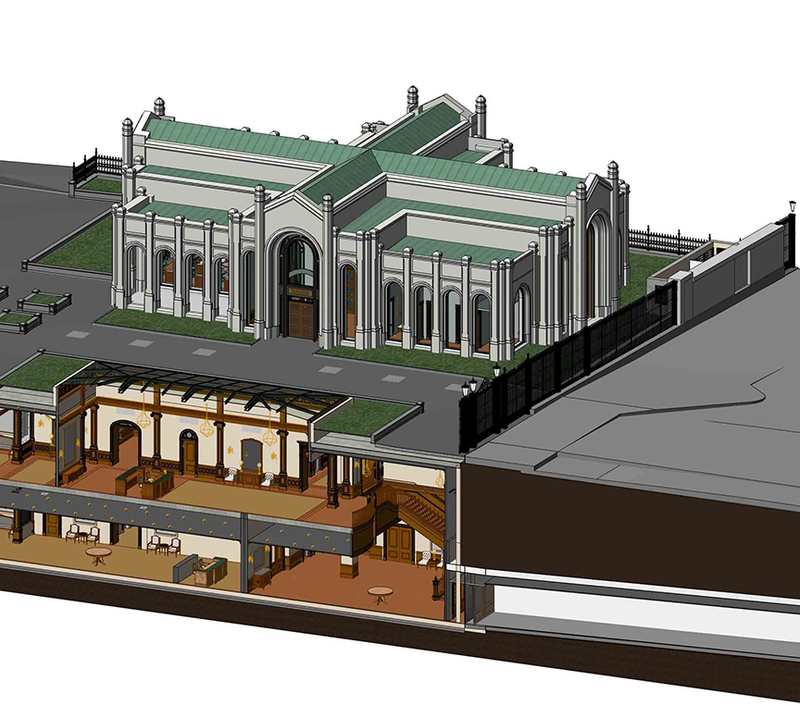 Following the renovation, temple patrons and guests will enter the temple through the new entry pavilions to the north and proceed down to a grand hall. The formal temple entry point (recommend desk) will sit underneath large skylights that will provide natural light and generous views of the temple above. Patrons will then proceed down the grand hall to the historic temple. For temple patrons who enter from the Conference Center parking area, a new guest access tunnel will be built under North Temple Street that will allow for direct underground entry to the grand hall from the parking structure. Construction of the Salt Lake Temple began in 1853 under the direction of Church President Brigham Young. The temple was dedicated 40 years later by Church President Wilford Woodruff on April 6, 1893. The temple has been renovated many times since its original dedication. The most extensive renovation took place from 1962 to 1966, during which new plumbing, electrical, heating and air conditioning systems were installed. An addition for sealing rooms was added to the north side of the temple, and the original temple annex was demolished with a new, larger annex constructed. During the renovation, the Church will closely coordinate pedestrian and vehicle traffic issues with Salt Lake City. It is expected that the North Visitors’ Center, Tabernacle and Assembly Hall will remain open to the public during construction. Tours by missionaries from the Temple Square Mission will continue to be available for guests during construction. 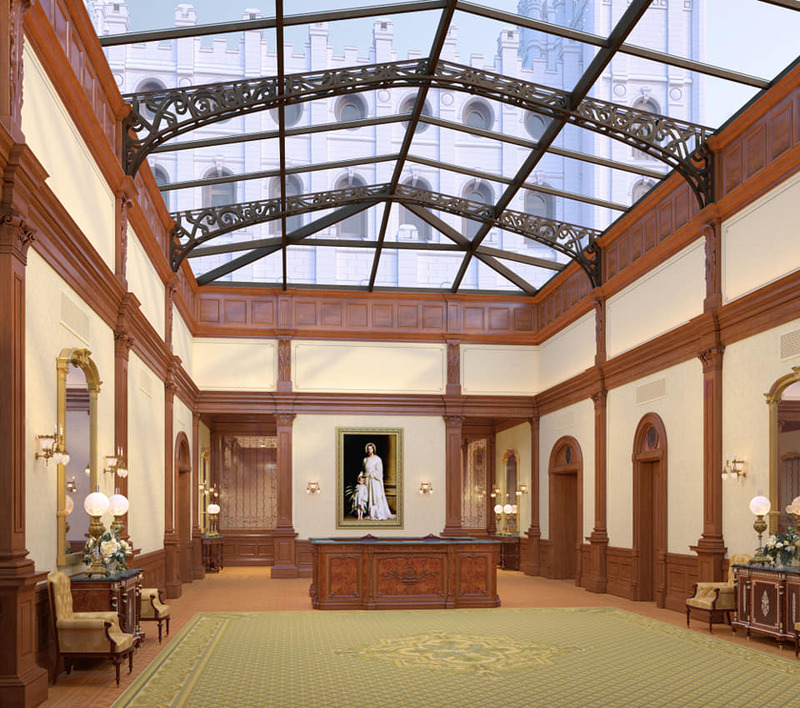 Other Temple Square attractions that will be accessible to visitors during the temple renovation include the Family History Library, Church History Museum, Church History Library, Conference Center, Joseph Smith Memorial Building, Lion House and Beehive House. President Nelson said he prays Notre Dame will rise again in newness of life. In March 2019, President Nelson and President M. Russell Ballard of the Quorum of the Twelve Apostles visited Pope Francis at the Vatican in Rome, Italy, the day before President Nelson dedicated the Rome Italy Temple. The Church’s Europe Area Presidency—Elder Paul V. Johnson, Elder Gary B. Sabin, and Elder Massimo De Feo—expressed sympathy to Michel Aupetit, archbishop of Paris. The Latter-day Saint leaders shared their hope both for the people of France and the entire Christian world that Notre Dame will be restored as a symbol of faith. Other Church leaders penned a separate letter to Bishop Oscar A. Solis, appointed in 2017 by Pope Francis to lead the Diocese of Salt Lake City. President Ballard and Elder Ronald A. Rasband of the Quorum of the Twelve Apostles, along with Elder Craig C. Christensen of the Church’s Utah Area Presidency, expressed to Bishop Solis their deep sadness at the damage done to Notre Dame. NAUVOO NEWS - Changes to Church leadership are reflected in a new chart of General Authorities and General Officers dated April 2019, available to view or download. A new Sunday School General Presidency, 10 General Authority Seventies, and 55 Area Seventies were called and sustained during the 189th Annual General Conference on April 6. President Dallin H. Oaks, First Counselor in the First Presidency, announced a new Sunday School General Presidency. Brother Mark L. Pace is the new president, with Brother Milton Camargo and Brother Jan E. Newman as his counselors. Also announced were 10 new General Authority Seventies: Elder Rubén V. Alliaud, Elder Jorge M. Alvarado, Elder Hans T. Boom, Elder L. Todd Budge, Elder Ricardo P. Giménez, Elder Peter M. Johnson, Elder John A. McCune, Elder James R. Rasband, Elder Benjamin M. Z. Tai, and Elder Alan R. Walker. View and download the PDF now. See the printed chart in the conference issue of the May Ensign and Liahona magazines. CHURCH NEWS - Stepping out of his front door near Paris’s Île Saint-Louise, Benjamin Poussard made his way toward the Pont de la Tournelle, a bridge crossing the Seine River. With plans to meet his wife to celebrate his birthday with a night out, he spotted smoke rising above the Île de la Cité, the island where the famous Notre Dame Cathedral sits at the heart of Paris. This photo is of Buffalo Bill Cody and members of his performing group. They were honored at a performance in the Tabernacle on Aug. 14, 1902. NAUVOO NEWS - The Tabernacle Choir at Temple Square and Orchestra at Temple Square announced today that their latest album, Let Us All Press On: Hymns of Praise and Inspiration, took the No. 1 spot on Billboard’s Classical Traditional chart, marking the 13th time that an album from “America’s Choir” has earned the top honor. Let Us All Press On marks the first full-length album of hymns from The Tabernacle Choir in almost seven years. The album features 14 brand new tracks including beloved hymn classics like “All Creatures of Our God and King” and “More Holiness Give Me.” Contained on the album is also the hymn, “Our Prayer to Thee,” with text written by President Russell M. Nelson. President Nelson wrote the words in 2003, and it was first performed as a hymn in April of that same year at the general conference, where it was matched to a tune by composer Joseph Parry. NOVOROSSIYSK, Russia -- A New video has been released by the Russian state media showing the arrest of two volunteers for the Church of Jesus Christ of Latter-day Saints on March 1, 2019. Teaching religion is permitted only inside church buildings. Typical street or door-to-door proselytizing in not permitted, but Church meetings and lessons are legal. The video clip shows not only the arrest but also shows Russian authorities going through belongings of the two volunteers. Their church teaching materials seem to be of interest to the police including copies of the Book of Mormon, and personal planners commonly used by Latter-day Saint missionaries. The 2019 Nauvoo Pageant preparations are underway. 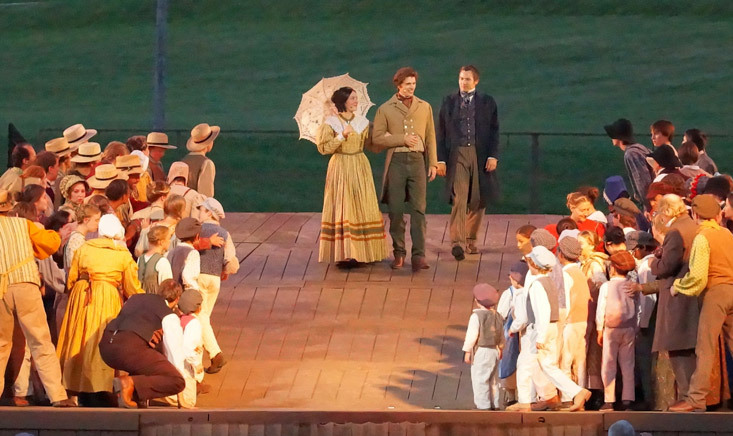 The beautiful theatrical outdoor stage performance is put on each summer in beautiful Nauvoo, Illinois by a cast and crew of over 1,100 people. The legacy of early Latter-day Saints in Nauvoo is told through song, dance, music and acting. The Pageant season brings historical vignettes in Old Nauvoo and the 1840s Frontier Country Fair as a fun and exciting part of the pageant's pre-show activities. The 2019 Nauvoo Pageant: Will be held on Tuesdays, Thursdays, and Saturdays - telling the story of early Latter-day Saint Church members who first settled the City of Nauvoo in 1839. It's full of music, singing, funny moments and a few tear jerkers. You'll love the entire performance. The 2019 British Pageant, “Truth Will Prevail,” held on Wednesdays and Fridays, and tells the history of early Saints in the British Isles. With delightful music and acting that will touch your heart and put a smile on your face, you'll learn the true stories of some very amazing families that made the hard sacrifice to come to America and follow their faith. Both the 2019 Nauvoo Pageant & the British pageants are based on actual journals and historic records from the 1800s. You experience both traditional period music and dancing as well as amazing original music. 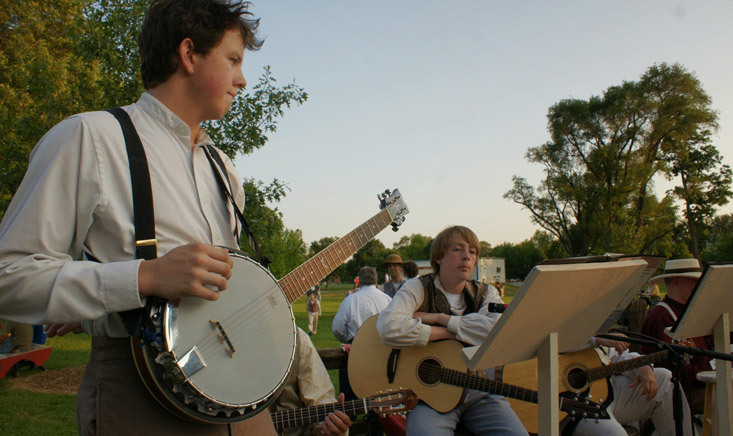 Thousands visit Nauvoo each year to enjoy both performances. While in Nauvoo your family can also take free wagin rides around the old Nauvoo historic town - experience period blacksmith and tin shops - visit the old Times & Seasons newspaper press or take you whole family to the Family living center for pioneer games and crafts: ALL FREE. 2019 is a great year to come see beautiful Nauvoo. The Nauvoo Pageant will be presented on Tuesday, Thursday, and Saturday. The British Pageant will be presented on Wednesday and Friday. ADMISSION: Admission is free. No ticket is required, and no reservation is necessary. After being arrested and detained for weeks by local authorities in Russia, two young Latter-day Saint volunteers have been released and deported following a decision from Novorossiysk’s Primorsky District Court, which found the two volunteers guilty of violating Russia’s enter and exit rules on March 2. One volunteer has been identified as Kole Brodowski, of Garden Grove, Calif. The second volunteer has been identified as David Udo Gaag of Bothell, Wash.
Their arrest and detention on March 1 during a meeting at a Church meetinghouse in Novorissiysk made international news. According to their attorney, Sergei Glizuntsa, as reported by Tass—Russia’s state-run news agency—the two young volunteers have had no complaints about the conditions of their detention. Following the arrest, the president of the Russia Rostov-na-Donu Mission—where the two are assigned—traveled to Novorossiysk to visit the volunteers on Monday, March 4, and they were able to call home. Since 2016, when Russia implemented an anti-terrorism law, Church missionaries in the country have been redesignated as volunteers and all proselytizing can only occur in houses of worship. NAUVOO NEWS - It’s been over two weeks since volunteers for The Church of Jesus Christ of Latter-day Saints were arrested and detained in Russia, for allegedly teaching English without a license. Shortly after being detained a Russian judge ruled the two young men were in violation of their Visas and ordered them deported. Today, Eric Hawkins, a spokesman for the church, stated there’s been no change in the status of the two volunteers, and they remain detained. Nauvoo News is monitoring the situation and will report any changes or updates. 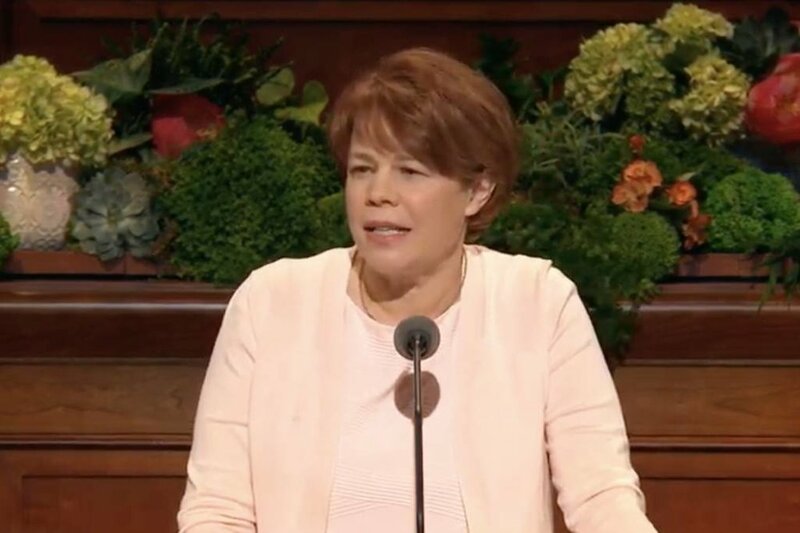 Sheri Dew, Chief Content Officer for Deseret Management Corporation, talks about what went on behind the scenes of the iconic photo of the First Presidency and Quorum of the Twelve Apostles taken this week in Rome. "This is an unprecedented moment," she said in a Church News video. "We know of no other time when the full First Presidency and Quorum of the Twelve have been outside of the United States together, let alone at a temple dedication."